With 6 Days Vietnam Classic Tour, it is the best choice for people who love to learn about Vietnam's culture and history but limited time. The first destination is the capital thousand years of civilization Hanoi with beautiful colonial buildings, lovely parks, museums. The next site is Halong Bay recognized two times as the World Heritage by UNESCO and the last one is dynamic and cosmopolitan Ho Chi Minh City. 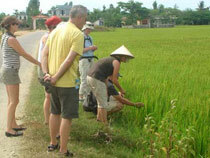 Upon arrival in Hanoi, you will be welcomed by our guide and transferred to your hotel. Hanoi is one of Asia's most charming cities, with its romantic tree-lined boulevards and colonial houses. The day is free for your own exploration and shopping. Overnight at hotel. You will be picked up at the hotel at 8:00am. Starting the day trip will be a visit of the Ho Chi Minh Complex, which compromises Ho Chi Minh’s mausoleum (closed on Mondays & Fridays), his former stilt-house residence, the Presidential Palace. You will then visit the Temple of Literature constructed in 1070 to worship Confucius, which served as the first Royal National University in Vietnam. The site also honors 82 Vietnamese doctorates who passed a number of rigid exams in the feudal ages. Their names, birthdays and birthplaces are engraved in 82 headstones perched on stone tortoises. It is widely believed that touching the heads of these tortoises will bring luck. Its peaceful green compound with its neatly maintained lawns, gardens and lotus ponds make it a tranquil hideaway from the city’s bustle and heat. Lunch will be served at a local restaurant. At 8:30am, after breakfast at the hotel, you drive for 3.5 hours through the Red River Delta to Halong. 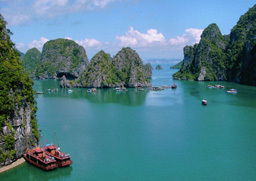 There will be several photo stops and coffee breaks en route before arriving at Halong’s pier around noon. Upon arrival, you will set out on a junk cruise through the bay while lunch is served. The junk will pass through the magical bay, where thousands of sculpted limestone islands rise from the emerald waters like spikes on a dragon’s back. After lunch, you will take a short trek to a nearby summit for a panoramic view of the bay, go for a swim at a quiet beach or sunbathe on the sundeck. Overnight onboard. Rise to the sound of water against the ship’s belly, and take an early morning dip followed by breakfast. Sitting on the upper deck, you can relax while taking in the breath-taking beauty of the karst landscape. After breakfast, explore Sung Sot Cave from 8:00 to 9:00am, swim and relax at Soi Sim Beach. At 9:30am, the boat will cruise back to the jetty while brunch is served from 10:30am to 11:30am. You will continue cruising through the bay, passing ever more fascinating limstone formations. Cabin check-out is at 11:45am. 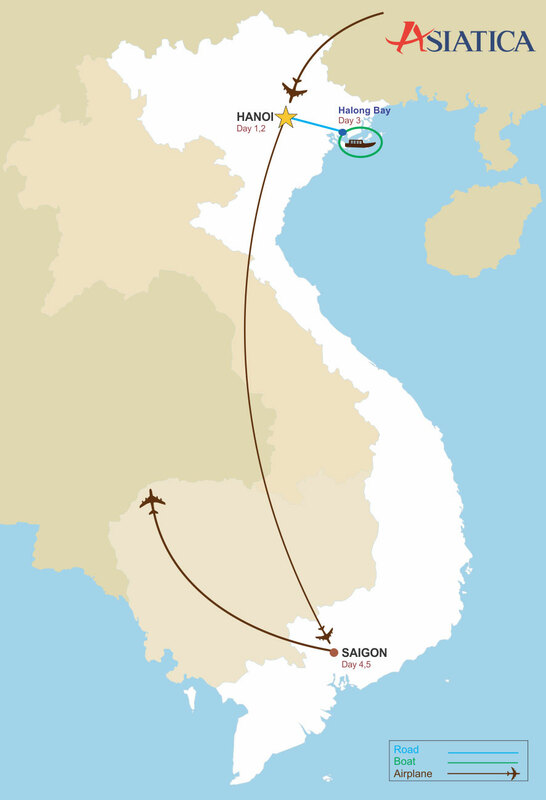 The boat arrives at the harbor around noon and you will be driven from Halong directly to Hanoi airport for your flight to Ho Chi Minh City. Upon arrival at Tan Son Nhat airport, you will be transferred to your hotel for check-in. Overnight at hotel in Ho Chi Minh City. 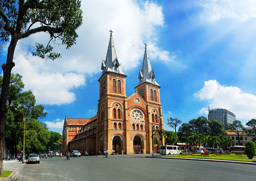 You will be picked up at 8:00am from your hotel in Saigon, to visit the Notre Dame Cathedral and the General Post Office. The Saigon city tour then continues along Dong Khoi Street, where the Opera House and the Peoples’ Committee building, built in 1897 by French architect Ferret Eugene, are situated. The 800 seat Opera House served as the home of the Lower House Assembly of South Vietnam after 1956. You will then visit The Reunification Palace, formerly known as Presidential Palace, which was the residence of the president of South Vietnam until the end of April 1975. Lunch will be served at a local restaurant. In the afternoon, you will visit the War Remnants Museum formerly known as the Museum of American War Crimes. This is a poignant display of the futility of war. Next on the sightseeing list is Thien Hau Pagoda located in Cho Lon, the city’s Chinatown. This pagoda is dedicated to the Goddess of the Sea. The most impressive features of the structure are the intricate friezes and the carved tableaus towards the front of the pagoda. The impressive incense coils inside the pagoda also make for some great photos. Another site that cannot be missed is Binh Tay Market or ‘Cho Lon’, which can be roughly translated to ‘big market’. Although the whole district lives up to its name a visit to this market really says it all. Selling everything from fake Ray Bans to dried squid, you are bound to enjoy a walk through the maze of stalls in this bustling market. 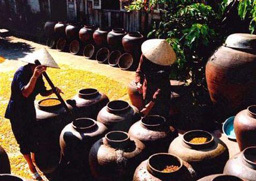 your tour of Saigon will end with a visit to a lacquer ware workshop. Overnight at hotel in Ho Chi Minh City. Note: Binh Tay market, an 88 year old structure is going under a comprehensive 365-day-restoration project starting from Nov 2016. During this renovation time, the visit will be arranged at temporary market, located on Thap Muoi Street, just opposite the existing market, with space for up to 1,077 stalls. Free time for a last bit of shopping or exploring the city on your own, before we take you to Tan Son Nhat airport for your flight home. The hotel room is available until noon only. Asiatica Travel's services end here.